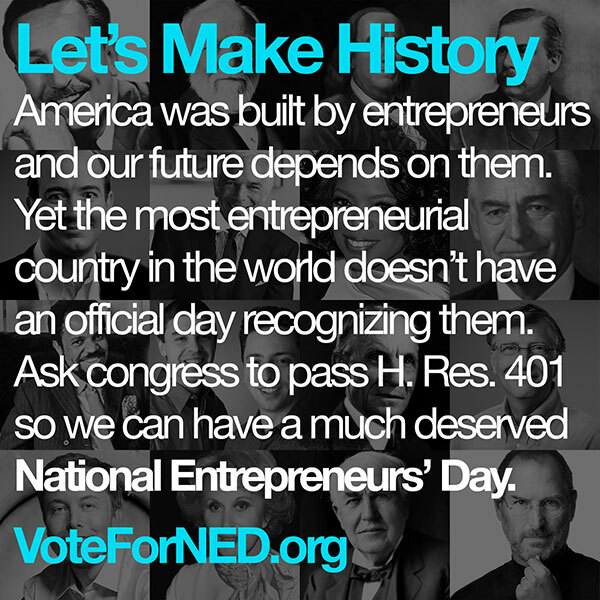 How can you support National Entrepreneurs’ Day in Congress? Congress hears us best when we speak in one broad, loud, concentrated voice. Broad means we generate votes in as many Congressional districts as possible. Loud means we hit our target for 50,000 votes. And concentrated means we funnel those messages into Congress during one limited period of time. Share this photo & message on your social networks to help us hit our target of 50,000 votes. What is National Entrepreneurs' Day? National Entrepreneurs’ Day was [started in 2010] by David Hauser and Siamak Taghaddos, co-founders of Grasshopper, the entrepreneur’s phone system, and Amir Tehrani, entrepreneur and co-founder of The Legacy Foundation. To date it's been a Presidential Proclamation every year, supported by the President. Now it's time to make it an official Day. VoteTocracy is our vote partner. Their site is capturing the voting, sending the messages to Congress and tracking our progress. VoteTocracy is a non-partisan engagement platform built to help citizens. Entrepreneurs: Can they bring prosperity? National Entrepreneurs’ Day — How did You Celebrate This Year? Did You Celebrate National Entrepreneurs’ Day This Year? Are You Ready for National Entrepreneurs' Day? National Entrepreneurs' Day - Will You Celebrate, Or Cry? A Day To Recognize Entrepreneurs: National Entrepreneurs' Day! Should Entrepreneurs Have Their Own National Holiday? Why Not?